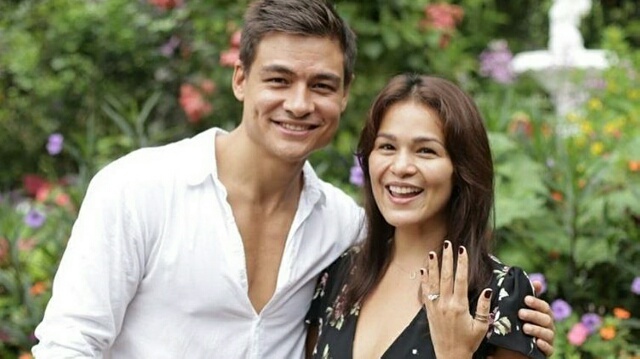 Cosmo.ph had a brief chat with fashion designer Rajo Laurel via Summit Media Editorial Director Myrza Sison to get more details on the engagement of his close friends Iza Calzado and Ben Wintle. Rajo was one of the witnesses of the special occasion. According to Rajo, the proposal, which Ben had been planning for a month, happened at Sonya's Garden, Tagaytay City. Surrounded by 30 to 35 of their closest family and friends, Rajo said that Ben proposed to Iza in Tagalog just before lunch on October 8, 2017, and asked her, "Can we eat and dance together forever?" Rajo added, "She was bewildered!" In a video captured by Rajo himself, Ben approached an unsuspecting Iza, who stood on the pavement just outside the dining area. The British-Filipino businessman was carrying a bouquet of flowers which made the actress a little nervous. Ben then asked Iza, "How are you feeling?" To which Iza replied, "I don't know. I'm good." As Ben tried to comfort Iza, she said, "I'm not naiiyak, it's okay." While waiting for the events to unfold, a fidgety Iza exclaimed, "What's happening?! Wait!" She then made a joke, "Can I see the ring first?" When Ben went down on one knee, Iza turned away from him and started crying. She faced Ben again, who asked her, "Will you marry me?" Iza only wiped her tears and answered with a nod.